Pointing to the location of hip pain can be difficult and it can be even more difficult to describe where the pain is generating. Hip pain is a common complaint that can be caused by a variety of problems and presents with an even wider variety of symptoms. The hip joint is a ball and socket joint supported by bone, cartilage, ligaments, tendons and muscles, all of which have different pain presentations. The location and description of your hip pain can provide valuable clues about the underlying cause. Problems within the hip joint itself tends to result in pain on the inside of the thigh or groin region. Common problems in the joint include osteoarthritis, labral tears, cartilage damage, femoral acetabular impingement and capsular sprains. Hip pain on the outside of the hip and upper thigh can represent tendon, muscle or bursa problems. While posterior hip or low back pain is usually caused by problems with muscles, ligaments, tendons, sacroiliac joint dysfunction (instability) and other soft tissues that surround your hip joint. Sometimes, hip pain can be caused by diseases and conditions in other areas of your body, such as your lower back or your knees. Problems in and around the hip can also cause pain in other locations. This type of pain is called referred pain. Pain can be referred by irritated nerves, muscles, ligaments and tendons. Referred pain from ligaments and tendons follow certain predictable patterns called sclerotomes, this is the most common source of referred pain. Sclerotomal tissues (tendonous and ligamentous pain generators) typically mediate pain described as “deep, dull, and toothache-like.” Sclerotomal pain patterns are frequently overlooked because they may project some distance from their pain generators. In addition, these pain patterns are infrequently taught to physicians. Unfamiliarity with referral pain patterns can lead to misdiagnoses as well as inappropriate treatments. For example, the sacroiliac ligaments, located in the lower back and pelvis, refer pain to the lateral foot, which cause the symptoms resulting in a common misdiagnosis of sciatica. Pain traveling down the back of the leg and foot is usually from ligament weakness in the sacroiliac joint, not from a pinched sciatic nerve. Pain over the outside of the hip is generally from a sick gluteus medias tendon and often misdiagnosed as bursitis. the Iliolumbar ligament refers pain into the groin; in fact, an Iliolumbar ligament sprain should be considered for any unexplained groin pain. Tendons are the thick bands of tissue that attach bones to muscles. Tendinitis is inflammation or irritation of the tendons. It's usually caused by repetitive stress from overuse. If not a chronic condition, this can usually be treated with conservative care, such as physical therapy or bracing. When chronic or lasting more than 3 weeks, more aggressive therapies may be needed. Some treatment options would include ultrasound guided injections of regenerative substances in conjunction with physical therapy. Repeated activities can put strain on the muscles, tendons, and ligaments that support the hips. When these structures become inflamed from overuse, they can cause pain and prevent the hip from functioning normally. If not a chronic condition, this can usually be treated with conservative care, such as physical therapy or bracing. Arthritic conditions, such as osteoarthritis, are among the most common causes of hip pain, especially in older adults. Arthritis leads to inflammation of the hip joint and the breakdown of the cartilage that normally cushions your hip bones. The pain gradually gets worse as the arthritis progresses. People with arthritis also feel stiffness and have reduced range of motion in the hip. Inflammation of the small, fluid-filled sacs (called bursae) that protect muscles and tendons is usually due to repetitive activities that overwork or irritate the hip joint. True bursitis of the hip is very rare and is more likely a tendon problem that is misdiagnosed as a bursa problem. If bursitis does exist it usually responds well to a cortisone injection. This is done with ultrasound guidance to ensure proper placement. 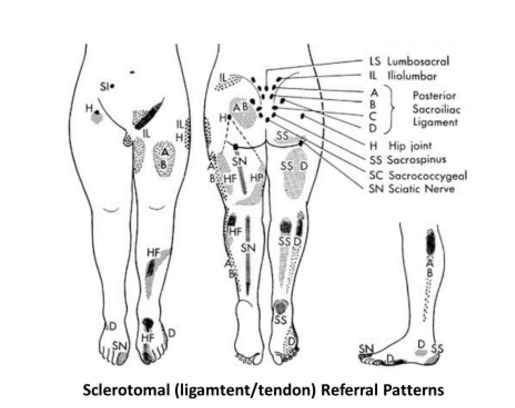 As demonstrated in the referral pattern diagram, SI joint pain and SI ligament pain can be very confusing. 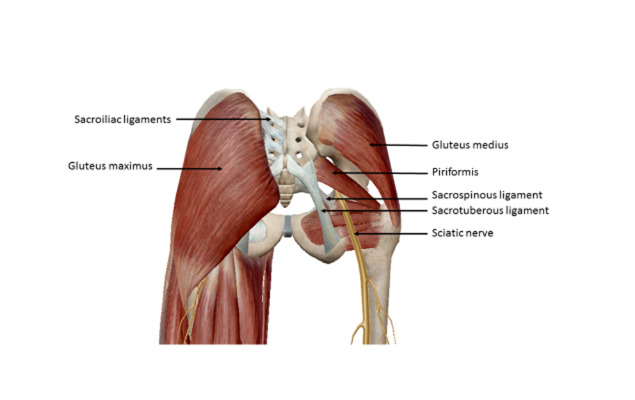 The SI joint and SI joint ligaments can refer pain down the leg, to the groin and into the hip. This is why a skilled examination is necessary to determine the main pain generator. It is possible to have true hip joint pain in conjunction with SI joint pain which sometimes makes the exam confusing. When this happens, a stepwise approach to diagnosing and treating the main pain generators is necessary. Once the pain generators have been established, oftentimes a diagnostic anesthetic injection can be given to ascertain whether or not the pain is coming from a specific region. The most common causes for SI joint pain and SI joint referred pain are ligaments. The ligament pains are oftentimes referred to as achy, deep, sharp, stabbing and constant. Pain in the ligaments often result in destabilization of the SI joint. The best treatment option for this is a strengthening program in conjunction with regenerative injections to stabilize these very large ligaments. Unfortunately, this type of pain is more common in women than in men. Sometimes braces and belts will help with this pain.